Information on the planned improvement works to Twickenham Station. Twickenham Station is not owned by Richmond Council. In December 2011, our Planning Committee granted planning permission for a proposal by Solum, an external developer, to improve the station. Solum is a partnership between Network Rail and Kier Property that was established to bring private investment into the rail network by generating funds from the development of under-used railway land. It has completed projects at Christchurch, Epsom, Haywards Heath and Walthamstow. The agreed development had been scaled down from a previous proposal which would have included over 160 additional homes and have been up to nine stories high. The development includes key improvements to the station, incorporating a new modern entrance and ticket hall, lifts to all platforms and improved public transport interchange facilities. There will also be a café, a riverside walk and a new public plaza with a development of flats above the scheme. Since the decision was made, a group of local residents who formed Twickenham Residents Action Group (TRAG) sought to challenge it and presented its case to the High Court. A judge reviewed all the evidence presented and agreed with the Council that the process followed was correct and the decision properly made. TRAG appealed the decision and three Court of Appeal judges dismissed the appeal. TRAG then applied to the Supreme Court for leave to appeal. On 26 July 2013 three Supreme Court judges refused permission to take this any further. Following this, the Greater London Authority and Secretary of State for Communities and Local Government both announced that they would not be overriding the Planning Committee decision. The developers decided not to commence work until after the Rugby World Cup. This work commenced in spring 2017. The scheme will provide a new station with modern facilities as well as an opportunity to build new homes and retail units around a new station plaza plus a riverside walk beside the River Crane. The new station will be built on a podium over the main rail lines. 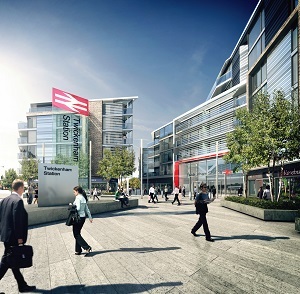 This will enable a new public plaza to be created at the entrance to the relocated ticket office, which will provide direct access to the platforms via steps and lifts. 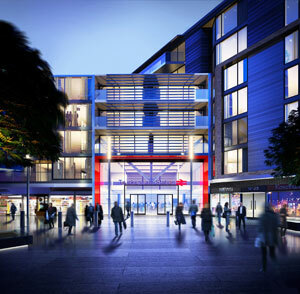 Retail units will be provided around the hard landscaped open plaza to create a sense of arrival. Station car parking and a new taxi pick up and drop-off facility will be provided below the podium. The number of secure bicycle spaces will be increased to 250 and changes to the bus interchange at road level are proposed. New homes will be provided in three blocks built above and beside the new station. In total, around 115 apartments will be created. The final key element to the redevelopment will be to open up the neglected area along the River Crane. A new riverside link will be created for pedestrians from Moormead Park to the new station plaza. This will be in association with the new pathway provided by the new Brewery Wharf development and will extend this walkway beyond the station and towards Twickenham Stoop and the new Richmond College development. See Solum's latest news for a more detailed timeline. As part of the planning permission, Solum have to assign a Community Liaison Officer to work with the developer and the community. Their job will be to ensure that local residents are informed of the building works and also have a point of contact to ask questions and raise issues. The Temporary Community Liaison Officer is Rowan Cole. Residents can contact Solum at community@twickenhamforward.com. If you have an urgent enquiry during the building works, the developer has established a 24-hour helpline for emergencies and can be contacted on 07971 125180. You can sign up to receive updates from Solum to keep up-to-date with the latest developments. Throughout the course of the redevelopment, there will be weekend/bank holiday closures of the station to enable trackside work. Visit the South Western Railway website to keep informed of these dates.